AC/DC have announced details of their upcoming Backtracks boxset. And get this: the thing is so big and comprehensive that it comes housed inside a guitar amplifier. An actual working amp, we might add. 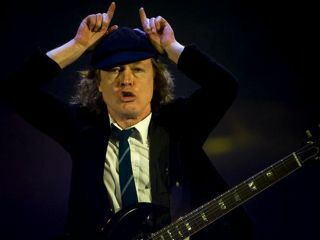 The first CD features 18 studio outtakes including songs that have appeared on 12", tour editions and the Australian versions of some AC/DC albums. All the tracks have been remastered and make their CD debut. The other two CDs boast live rarities spanning from 1977 to 2000. The first DVD will contain the music-video collection Family Jewels 3, featuring all the band's clips from 1992-2009, while the second DVD showcases AC/DC/s 2003 club performance in Munich, Germany. And for folks with working turntables, the 180-gram audiophile vinyl will feature 12 of the studio rarities featured on the first CD. All this and an amp, too! There's other goodies as well, such as a 164-page coffee table book complete with rare photos, a guitar pick, reproductions of posters, tour flyers and studio track sheets, plus an "I Do It For AC/DC" pin (the band's very first tour merch). But musicians will be particularly interested in the 12"x12"x4" packaging that is designed to resemble a vintage amplifier, because, as previously mentioned, the head really does work! OK, so it's only one watt - not exactly high-voltage firepower. Still, it's a collector's item no matter how you slice it. Hey, we tried plugging our guitars into the Beatles boxsets, and no dice.